Don’t be put off by their fluffy coats! You could be mistaken for thinking the Bichon Frise is just a fluffy toy pet, but they actually originated as a sailor’s dog so of course they love water (although their job was generally more as a sailor’s companion than as a retriever). The Italian and French nobility subsequently came to keep them too. The Bichon Frise breed was later officially admitted into the French stud book on 1934 and they have made for delightful pets for many a family ever since. The Bichon Frise dog breed is small in size and has a distinctly beautiful white coat. What does the name Bichon Frise mean? It literally translates from French as “Curly pet” or “Curly lap dog”. Their resemblance to stuffed teddy bears is undeniable. Cute! Bichons existed in the Mediterranean area originally, (Spain first, then France) and they were divided into four groups: the Bichon Bolognaise, the Bichon Maltese, Bichon Tenerife and Bichon Havanese. Sailors traded these pets so the breed spread with ease, even becoming favorites of the Spanish and French nobility. Napolean III and King Henry III were two well known owners. Today’s Bichon Frise derive from the Bichon Tenerife and were named as such in 1934. They travelled together with the sailors and were spread to most continents, even as far as Australia in the mid-1960s due to a popular mini-series, “Meweth”. The coat of a Bichon Frise will generally not shed hair, or will only do so when bathed. They need to be groomed once a month at a minimum. Also, to avoid hematoma, their coat should be brushed every day. Bichon Frise require frequent bathing, brushing and trimming in order to stay clean, and you should control their saliva as potential allergen. They are hypoallergenic, so they are good fit for people with allergies. But, if you are quite sensitive be aware that an allergy can still occur. Bichon frise are known as cheerful, merry, affectionate, sensitive, gentle mannered and playful. They are attention-seekers and love human company. They like to go out a lot and love to socialize. They usually have medium to high intelligence. They get along with children very well because of their playful and energetic character. They like to protect their territory but still get along well with other pets and small children. They should be trained from when they are a puppy and in continuity. 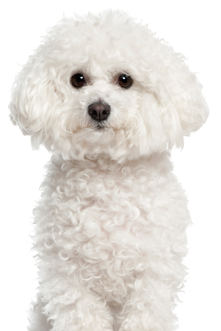 Bichon frise have a rounded skull and muzzle that you wouldn’t say is very pointy. They have a long tail that is curly, round dark eyes and a black nose. They are always white with a dense, curly or wavy coat. You might also find them with an apricot, cream or buff color around their paws, ears or snout. The Bichon frise is a small dog and its weight goes from 5 to 10kg (10 to 20lbs). Its height will be from 23 to 30cm (9 to 12in). The average lifespan of a Bichon frise is from 12 to 13 years. Oddly, in the UK they tend to live slightly longer than in the USA. Bichon Frise have a longer life expectancy than other purebred dogs. The name Bichon Frise means “curly lap dog” in French. Owners love to give them really cute hairstyles which suits their affectionate and sensitive natures.